But the Proteas all-rounder’s catch in the third ODI against Pakistan was actually the sole highlight of a poor day in the field. The Proteas’ catching woes on the current Pakistan tour continued on Friday during the third ODI in Centurion. After the horror second session of the second day in the final Test at the Wanderers earlier this month, where they dropped four catches in quick succession, the butter fingers returned. Up until the 40th over of Pakistan’s innings, who chose to bat first, South Africa had dropped three vital catches. It started with Andile Phehlukwayo, who allowed a mistimed pull from Babar Azam, on 11, burst through his hands. 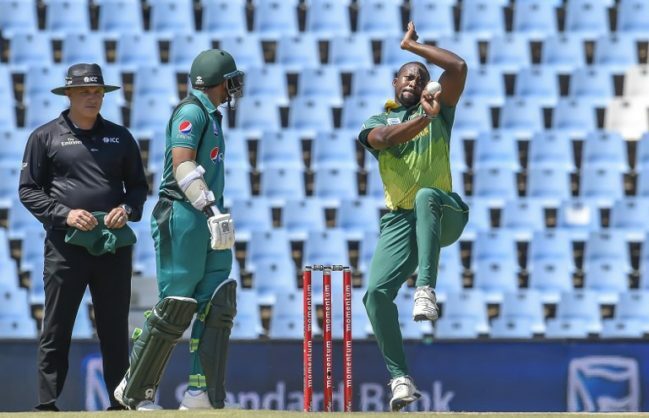 Then, Tabraiz Shamsi spilled a regulation catch from Imam-ul-Haq, who was on 53, when he drove a Dale Steyn full toss straight to him at mid-off. Imam later reached his century. And lastly, Mohammad Hafeez was dropped on 10 by Hashim Amla at slip off the unlucky Steyn. Hafeez strode to 52 off just 45 but his knock was ended by a magnificent grab by Phehlukwayo, driving to his left. Pakistan are 233-3 after 41 overs. It was at least one highlight in the field.